First Time Starter S Y Sky Rockets to Five Length Win in $200,000 Evening Jewel S.
ARCADIA, Calif. (April 8, 2017)–Head and head with heavily favored Miss Sunset turning for home, Nick Alexander’s homebred first time starter S Y Sky powered to a convincing 5 ½ length win in Saturday’s $200,000 Evening Jewel Stakes under Joe Talamo. 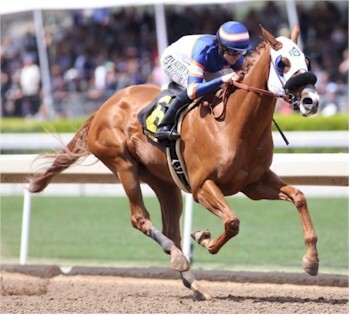 Trained by Phil D’Amato, the 3-year-old chestnut filly by Grazen got 6 ½ furlongs in 1:17.52. Off at 6-1 in a field of eight sophomore fillies bred or sired in California, S Y Sky paid $14.80, $7.80 and $3.80. Out of Alexander’s Sky Mesa mare, Sky Marni, S Y Sky, who broke from post position six, got the winner’s share of $110,000, plus a Cal-bred incentive bonus for breaking her maiden of $17,500, resulting in a total payday of $127,500. Ridden by Mario Gutierrez, Radish, who broke from post two, sat third most of the way and overhauled the favorite by a head at the wire for second money. Off at 18-1, she paid $13.20 and $4.40. Miss Sunset, who added blinkers today and broke from the far outside, tired late to finish third, 4 ¼ lengths in front of Starr of Quality. Ridden by Edwin Maldonado, Miss Sunset was off at 3-5 and paid $2.20 to show. Fractions on the race were 21.94, 45.63 and 1:11.08.
https://tommytownfarms.com/wp-content/uploads/2016/02/TTT-LOGO-COLOR.png 0 0 none https://tommytownfarms.com/wp-content/uploads/2016/02/TTT-LOGO-COLOR.png none2017-04-08 22:18:132017-05-18 23:32:08First Time Starter S Y Sky Rockets to Five Length Win in $200,000 Evening Jewel S.
Old Topper Sires Winners of Maiden Allowance and Starter Allowance Races Ministers Wild Cat Son Takes Rich Echo Eddie S.